24% Off Orders at M&Co - 48 Hour Sale Special! Up to 70% Off Orders in the Mid Season Sale at M&Co Don't miss the awesome savings to be had in this sitewide sale! 15% Off Suit Hire Orders at M&Co Hire a swanky suit for any upcoming events with 15% off today at M&Co. 15% Off First Order with Loyalty Card Sign-ups at M&Co Earn rewards every time you shop and get exclusive benefits with the M&Co Loyalty Card, including 15% off your next order. £10 Off Orders with Friend Referrals at M&Co Tell a friend about M&Co and they'll receive 20% off their first order and you'll be rewarded with £10 off your next order! 30% Off Selected Women's New Season Orders at M&Co For a limited time only, you can get a great 30% off the latest ladies fashion to hit M&Co! Free Standard Delivery on Orders over £40 at M&Co Spend £40 or more at M&Co and you can get your order delivered for free! Find 50% Off Homeware in the Home Event at M&Co Spruce up your home for less, with up to 50% of a wide range of home furnishings and accessories at M&Co. Free Next Day Delivery on Orders over £80 at M&Co Get your order the very next day when you spend £80 or more at M&Co. 3 for 2 on Women's Jersey Tops at M&Co Get great savings on clothing at M&Co. 2 for £10 on Women's Cami Tops at M&Co A staple of any lady's wardrobe, now you can get them for even less. 2 for £30 on Women's Jeans at M&Co With styles and shapes to suit all, this offer is too good to miss! 2 for £12 on Selected Men's T-shirts at M&Co Get ready for summer sun with great deals on t-shirts at M&Co. M&Co is a British brand that's always going from strength to strength with its great array of apparel offerings for the whole family. Having won high street retail awards, and as one of the best big companies in the UK to work for, it's even beginning a global expansion in locations such as Dubai - so it's safe to say that M&Co is loved world-wide. The secret to its success? It's in its commitment to giving families stylish options that are reasonably priced, well made, and fun to wear. From babies through to adults, there are clothes and accessories to meet everybody's tastes and needs. At great prices too, clothes, homeware and accessories too can become even more affordable when you shop with vouchercloud - M&Co really is that number one store that ticks all the boxes. How do I use my M&Co discount code? Check out the current deals and offers at M&Co listed on vouchercloud. Click on the 'View Deal' or 'Get Code' link and copy your code if one is needed to claim the discount. Shop online at M&Co as you normally would, filling up your online shopping basket with whatever you'd like to buy using your discount voucher. Click 'My Bag' to checkout and enter your discount code into the field provided. Click 'Redeem' and the discounts will be applied to your total. If you use an offer that doesn't require a code, discounts will be added automatically. Sign up to the M&Co newsletter to stay in the know about new season picks, sales and exclusive discounts! Does M&Co offer a free delivery service? If you want to have your order delivered to your local M&Co store instead of your home, Click & Collect is free and takes 1-2 working days. Standard Home Delivery is also free on orders over £40 and Next Day Delivery is free on orders over £50. How can I redeem my M&Co loyalty vouchers? You will get a £5 M&Co voucher for every 500 points that you collect on the loyalty scheme - this can be used either in-store or online with your unique code! See here for more details. What are the payment methods accepted at M&Co online? M & Co accept payment through their website using any major credit or debit card including American Express cards, and you can also pay using a PayPal account if you prefer. Where is my nearest M&Co? Use the store finder to see where your nearest M&Co store is located. Standard Delivery is free over £40 - arrives in 3-5 working days. Standard Delivery is £3.50 otherwise. Next Day Delivery is free over £50 - order by 5pm. Saturday Delivery is also available for £7 - order by 5pm Friday. Express Click and Collect - arriving in 1-2 working days - is also available for £1. Simply fill out the returns form included in your parcel, affix the return label, and return all items as they arrived. Collect+ returns and in-store returns are also available, and are free. Returns must be made within 28 days. You can also reach M&Co online via their contact form. M&co was born out of love for stylish yet simple clothing, with a family-friendly ethos running right to its core. M&Co offers fashion both on the high street and online, and the whole family can make the most of the wide offering of clothes, accessories, underwear and sleepwear - including petite and plus-size women's ranges. You can also make a saving on the whole shebang when you use an M&Co discount code from vouchercloud. Whether you're looking for great, wearable fashion for yourself or trying to keep the kids kitting out in style - without breaking the bank - you'll find affordable and appealing designs to suit your needs here. 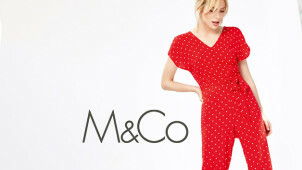 For easy, convenient fashion and homeware, M&Co is a great UK store to bookmark. M&Co has a loyalty programme that you can sign up for online, or by picking up a card in your local M&Co branch and registering it on the website. This allows you to collect points for shopping and as bonuses for other things, which you can then use to buy M&Co products. You will also get other treats and rewards such as invitations to exclusive events and sales, and a birthday surprise every year. M&Co has a very good range of clothing to suit different types of people, including plus size and petite ranges for women. They also have a range specifically dedicated to girls between the 9-13 age range, which can be a notoriously difficult time in fashion terms when girls aren't ready for adult sizes yet, but don't want to wear children’s styles. Shop with an M and Co voucher code and find the Kylie range for fashionable and attractive clothes for girls in this demographic, at prices that mums will also love!